Mountain barriers and glaciation prevented Native Americans from settling California as early as other parts of the Americas. However, from around 6000 BC on, several population waves moved into the area. They spoke different languages, but in adapting to the California environment, they developed similar cultures. In Northwest California, abundant game, fish and wild food plants allowed a comfortable hunter-gather life without the need to range over large areas. Settlements were permanent with sturdy houses built of wood planks. People ventured out to collect seasonal resources such as salmon and acorns, two staples of the diet. With relatively small areas able to support a village, California developed more distinct tribes than anywhere else in North America. Although the abundance of natural resources did not encourage agriculture, California Indians managed their wild food sources by pruning, selective harvesting, and limited burning. Most California Indians did not make pottery, but basket making became a high art. Tribes of the Humboldt area used the twining technique with elaborate overlay designs. Women wove baskets tight enough to hold water and even to cook in. Basketry hats were a distinctive feature of women's clothing. Local tribes did not have chiefs. The wealthiest man in the village was usually the most influential in decision making. Wealth was counted in dentalia shells, obsidian blades, woodpecker scalps, and dance regalia. 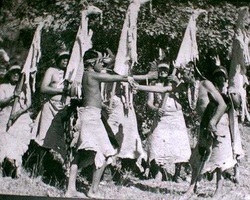 A wealthy man was expected to support others and sponsor ceremonial dances. Warfare among local tribes was infrequent because disputes were generally settled by paying compensation. Spiritual beliefs of area Indians reflected their close links with the natural world. The spirits of plants and animals were thanked before their lives were taken, and regular ceremonies were held to thank the Creator for life and to cleanse the world from past misdeeds. Shamans, often women, regularly interacted with spirits to seek guidance and bring healing.